Gas furnaces are one of the most popular, effective, and cost efficient ways to heat your home during the winter months. We’re not making that up, even the US Dept of Energy says so, with gas heat being used in almost 50% of all homes! Regardless of where you live through the USA, as long as you have access to natural gas or propane gas, you can have a highly efficiency and reasonably priced gas furnace installed at your house at an affordable cost. In this Furnace Price Guide, we’re going to cover both Natural Gas, and furnaces that have been converted to use LP, or Liquid Propane Gas. We’ll share both wholesale and dealer installed gas furnace prices for the equipment from various top rated brands, as well as what cost you may expect to pay for variables like different sized furnaces, higher efficiency, and of course estimated repair costs. At the bottom of the page you’ll find a section dedicated to user submitted prices, that contain what readers and homeowners like yourself paid for their own furnace replacement cost, or complete HVAC system including an ac unit or heat pump matched to the furnace. The cost of a new or replacement gas furnace is approximately $1,310 for a basic furnace before installation, and up to $6,240 for a high efficiency gas furnace, installed by a professional. Efficiency, location of the unit, and consumer demand will affect the price you pay. Note: These average prices do not include central ac or any other components. These are gas furnace only estimates. April 2019 | We updated 2018 and 2019 pricing in all gas furnace tables with new repair costs, installation cost estimates and shared costs, with or without a central air system, from other homeowners. Furnaces are produced in Basic, Better and Best lines to attract buyers at all price levels. For example, Carrier makes Comfort (Basic), Performance (Better) and Infinity (Best) lines. Lennox’s tiers are Merit, Elite and Signature Series. A few brands are strictly budget brands. Here’s what you can expect in each quality tier. Basic: The most affordable furnaces are built with entry-level parts. Warranty coverage is 20 years for the heat exchanger and 5 years on other parts. Most are single-stage furnaces. Expect durability of 14-17 years. Better: Mid-priced furnaces use good-quality parts backed by better warranties. The heat exchanger warranty for most is 20 years, but a few offer lifetime warranties. General parts warranties are 10 years. Single-stage and two-stage furnaces are common. Durability is 17-20 years. Best: Top of the line furnaces are built with premium parts and backed with lifetime heat exchanger warranties and parts warranties of 10 or 12 years. Some brands offer furnace replacement warranties. For example, if the heat exchanger fails in the first 5 or 10 years, the entire furnace will be replaced, not just the part. This category includes two-stage and variable capacity furnaces with longevity of 20+ years. Performance is the level of climate control and heating comfort a furnace provides. It has a significant impact on cost. Single-stage furnaces heat at 100% capacity and often have single-speed blowers. The results can be temperature swings of a few degrees and cool air coming from grates at the start and end of a cycle. Single-stage furnaces are the most affordable. Two-stage furnaces run at 65% capacity when just a little heat is needed to maintain the desired temperature. They often run at full capacity in very cold weather or when you turn up the thermostat more than a few degrees. Multispeed and variable-speed blower motors create heating that is balanced and comfortable compared with single-stage furnaces. These are mid-priced gas furnaces. Variable capacity furnaces modulate heat from 40% or less to 100%. The valve adjusts in small increments to deliver precise heating with little waste. It’s like cruise control for heating. Modulating gas furnaces have variable-speed blowers for optimal indoor comfort. As you would expect, they are the costliest too. Note on air conditioning: If you have central AC, then the furnace supports it. Cooling comfort and dehumidification improves as the performance level goes up. Furnace efficiency ratings are given in AFUE, the annualized fuel utilization efficiency. AFUE is the amount of heat that is transferred into your home’s heating ducts. For example, a 90% AFUE furnace makes use of 90% of the heat. The other 10% is lost in the exhaust. 80% AFUE furnaces are ideal for warm climates. They are also used in part-time locations like vacation homes. These furnaces have one heat exchanger. Your options are affordable single-stage 80% furnaces and mid-priced two-stage 80% furnaces, some with variable-speed blowers. Furnaces with 90% AFUE and higher are available at all quality levels. They are chosen by homeowners in colder climates and those who want to lower energy use and cost regardless of climate. Single-stage models range in efficiency from 90% to about 96%. Two-stage furnaces offer efficiency from 94% to 97.5%. Many have variable-speed blowers for improved climate comfort. Variable capacity gas furnaces start at 95% and can exceed 98% AFUE. Their ability to change capacity in small increments is the key to higher efficiency. All have variable speed blowers. 90% AFUE furnaces have a secondary heat exchanger to remove more heat from exhaust gases. They are commonly called condensing furnaces because the exhaust cools to the point that moisture in it condenses onto the secondary heat exchanger. Gas furnaces range in size from about 30,000 BTUs for small areas, to more than 140,000 BTUs for larger homes, and the cost of each rises with size. The exact size range varies with each model. Most models are produced in increments of 15,000 to 20,000 BTUs, for example: 60k-80k btu’s, or 100k-120k btu’s. If your home needs a furnace that can deliver +/- 80,000 BTUs, you’ve got efficiency options. The brand or manufacturer of gas furnace you decide to purchase for your home will definitely have an effect on both the wholesale cost, and installed gas (or propane) furnace price. Just like any other HVAC product in the consumer market, there are different levels of quality with gas furnaces. That said, a poorly installed, top rated gas furnace is more likely to fail, than a professionally installed, lower rated furnace. Working with a professional HVAC contractor is just as important as choosing the right furnace brand. While we focus primarily on natural gas, most can be converted to a propane gas for a very small fee. In most cases, it involves replacing the gas valve, the burners, jets, or a combination of the parts. Depending on your furnace, the kits cost in the $25 – $100 range. As you review the pricing tables below, you can adjust the cost to add in the conversion kit, to get the estimated propane furnace price for your needs. In order to display average furnace prices from different brands, we need to set a standard baseline. For this example, we’ll use an 80,000 btu gas furnace with 90% AFUE efficiency, and a 3-ton (1200 cfm) fixed speed blower, being installed in a first floor utility closet, basement, or mechanical room. This setup would be common in an average 1600-2000 square foot home. The “Furnace Only” cost is considered the wholesale pricing, and “Approx Installed Cost” is an estimate of the furnace, including installation cost, and no other accessories or a central air unit. When you buy a new gas furnace, it’s very important that you get the properly sized unit for your home. If it’s too big, the furnace will short cycle on and off, you’ll end up with inadequate heating and lower the long-term reliability of the furnace. Too small, and it will run all the time, never properly heating your home and wasting quite a bit of energy. The only accurate way to get a properly sized gas furnace is to run a heat loss load calculation on your home. You can find do it yourself tools to do it on your own as a reference, or request that your HVAC contractor supply one for you. Many areas of the USA now require an HVAC load test (Called Manual J) to get permits and inspections on new furnace installation. For the purpose of this price comparison of different size systems, we are basing the costs on standard (80-90% afue) to high efficiency (92-96% afue) furnaces, installed in a home with normal to average difficulty. If you’ve wondered about the cost difference of a high-efficiency gas furnace versus standard efficiency, the table below will help you understand. When you choose a high efficiency system, you pay more up front but save considerably on your monthly utility costs to heat your home. High efficiency gas furnace prices usually include features like variable speed blowers, multi-stage burners, high tech communication with other hvac system components, and much more. Trane and Carrier are leaders in high efficiency furnace models, check the list of Trane furnace prices to get a better idea of the brand cost. In addition to the initial cost burden, there are also considerations like different venting and condensation drains that must be taken into account by the installers.If not already equipped to handle it, these could add slightly to the cost of installation. We have used the same average furnace size and home mentioned above. 80k btu, 1200 cfm blower, average installation difficulty. Most furnace replacement can be done by a furnace technician and assistant in 5-10 hours. Furnace installation cost ranges from $1,100 to $1,950 when there are no unforeseen complications. Cost will be on the lower end of the range when the gas line, electrical circuit and wiring to the furnace are already in place and the old exhaust flue is reused. When any of those components require installation or modification, cost will rise. There are several other cost factors. The first is how easy the furnace location is to access. Working in a crawlspace or attic is more difficult, so cost is higher than if the location is a walkout basement or spacious first-floor utility closet. Installing an air conditioning coil as part of the job will increase cost too. Installation costs are higher during the busy season for furnace contractors, and you might have to wait longer for the installation. This is one reason why replacing an older furnace pre-emptively during a slow season for contractors can save you money. Deals and discounts are more common. The general cost of living in your area will affect price too, as it does all consumer goods. Your furnace is connected to the ductwork with a supply plenum and a cold air return. Both are made from sheet metal. These connections must be replaced when the heat opening and cold air return opening on the new furnace are a different size. The plenum and return can be fabricated onsite, or the contractor can take measurements and order the parts from a local sheet metal shop. The cost of an installed supply plenum is $250-$400. Fabrication and installation takes 1-2 hours. The cost of a cold air return is $350-$525. Fabrication and installation takes 2-3.5 hours. The installed cost of a thermostat starts at $95 for a simple programmable thermostat and wiring. Smart thermostats cost $300 to $600 installed based on the features of the thermostat you choose such as WiFi, geo-fencing, touchscreen control or smart home compatibility. You’ll need to replace the thermostat if the old one doesn’t support the furnace’s features. For example, if it’s a single-stage thermostat and you’re installing a two-stage furnace. Even when the old thermostat works with the new furnace, many homeowners replace it to get features the old one doesn’t have. Thermostats take less than 30 minutes to install when existing wiring is used. When wiring must be run from the furnace to the wall location, the job will take up to 2 hours. The cost to vent a furnace is $125-$600. The job takes 1-4 hours. The materials include the vent pipe, a vent at the roof or on a side wall of the home and connections, fittings and other installation parts and supplies. The major cost and factor is whether any or all of the old materials can be used to vent the new furnace. In most cases, many of the original parts are used. In furnace replacement, the existing gas electrical lines should be sufficient. In new construction, adding these components can be a significant cost. Gas line cost for a furnace is $400-$750 depending on the length of the line. The cost to run an electric line from the electrical panel to the furnace location is $150-$350 depending on distance and whether the panel and furnace are on the same level of the home. In the rare event a circuit must be added to the panel, cost for electrical will rise to $550-$900. Most HVAC contractors are licensed for all these projects, so hiring another contractor won’t be necessary. Most cities and counties require a permit to replace a gas furnace. Your contractor will know for sure, or you can get the information from the building code department. Homeowner safety is the reason municipalities require a permit for furnace replacement. The inspector will check the gas connection, wiring and exhaust chimney to ensure that the installation has been made properly. This reduces the risks associated with gas furnaces including gas explosions, fires and poisoning from carbon monoxide from leaking furnace exhaust. The cost of a permit for furnace replacement is $35-$100. Expect one inspection. You will definitely need one or more permits for gas furnace installation in new construction. The mechanical permit includes inspection for proper installation of the gas line and exhaust. The cost is $75-$150 for just a furnace. If central air conditioning is also being installed, the price can double. Two mechanical inspections, rough and final inspections, are usually done for furnace installation in new construction. The circuit and wiring leading to the gas furnace will be inspected as part of the electrical permit. There are several ways to save money on a gas furnace through rebates and deals. Manufacturer discounts: Throughout the year, many major brands put their equipment on sale. Sales usually happen during slow times for local HVAC contractors such as late winter and early fall when there isn’t high demand for heating or cooling installation or repair. The manufacturer might also be trying to sell furnaces it plans to discontinue or a model it intends to modify for next season. These discount prices are advertised on the brand websites and the websites of local HVAC contractors. You might also hear about discounts in radio ads from brands with big advertising budgets like Carrier, Lennox and Trane. Energy company rebates: Many energy providers give rebates of $250-$500 for the installation of Energy Star gas furnaces. These rebates are available any time of the year. Your energy provider’s website: This is the fastest way to see what rebates are available. You’ll find the AFUE rating the furnace must meet to qualify for the rebate. Manufacturer websites: If you’re sold on a specific brand, this is a good option. Most brand sites have a Rebates page which can be found using a search engine or the search box on the site. This Bryant Rebate page is an example. Once on the Rebate page, use your zip code to find energy company rebates in your area. The Energy Star Rebate Finder: Search for rebates on Energy Star-qualified furnaces using your zip code. DsireUSA: This is the Database of State Incentives for Renewables and Efficiency. It is a large, comprehensive database of state, local and energy provider discounts and rebates. Start your search with your zip code, and then use the filters to narrow your search to an efficient gas furnace or other HVAC component you’re installing. Many contractors are also aware of discounts and rebates. This is especially true if they are certified installers for a particular brand. Fixing a broken gas furnace is a job best left to a qualified HVAC technician. Once you get past return air filters and the thermostat, you will likely need specialized tools and the correct furnace manuals to understand diagnostic codes and troubleshooting procedures for your specific brand of your furnace. Most furnace repair companies work from a flat rate repair cost book, or use a factor of parts + labor, to determine the price you pay for the furnace repair. There are good and bad about both pricing methods, and the industry mix is relatively equally split. The gas furnace parts only cost is based on what you could buy the part for yourself, if you were to handle all troubleshooting, track down the part, and complete the repair 100% on your own. The install time is based on the approximate time it would take a professionally trained technician to diagnosis, remove & replace, and confirm the gas furnace being in good working condition. The total cost of parts installed in the third column, includes all parts and labor, including the service call cost. Note: If your gas furnace is more than 8-10 years old, or the total cost of the service call and your repair is more than $750, you should always ask for a full replacement estimate, and always get a second opinion if you have the ability to do so. 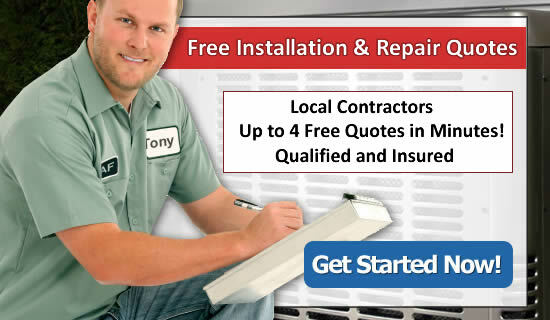 If you would like free quotes from qualified local contractors, click here. Partners in our system are qualified, local to you, and ready to provide competitive pricing quotes. Although the new furnace and repair prices listed on this page are provided from industry price sheets and professional resources, we also rely on feedback and price submissions from our visitors like yourself. If you recently paid for a gas furnace repair, or had a new gas furnace installed at your home, please consider sharing the information with us and future visitors, by completing our short project questionnaire. You personal information is protected and no personally identifying information will be posted on our website. Trane XV95 Installed in December, 2015. An Aprilaire 700 Humidifier was an addition $700. Removal of current HVAC. AND Installation 11/17/15-11/19/15. New Lennox furnace 97.4 AFUE, AC 20 SEER, Thermostat iComfort Wi-Fi, with Humidifier. Lennox ML195 (95%), for purchase/install in September. No rebates. New unit was installed, with duct modifications within 36 hours. Heating season revealed that the 60,000 BTU unit provided was not sufficient to maintain comfortable temperature in 1900 sq ft house. Replaced 16-year old Bryant gas furnace with damaged heat exchanger that was still under warranty. Carrier offered a $900 rebate which brought the cost down to $2,997. Installation took 2 technicians one 10-hour day. Installed by Four Seasons HVAC in Chicago. They ran new PVC drilled holes through the brick and over all did a great job. EL296UH090V36A $6060 PAID with CC. It was a very reasonable price from the quotes I got in this area. Very happy. A+ with BBB. I do see the prices on your Web site are way low but that’s way low with the quotes I got here. Our 20 year old Trane 100k btu furnace finally quit. Replaced with 90% furnace and new thermostat. We don’t use heat much but still chose to replace our old electric heater with a gas furnace matched to our central ac system. The entire system furnace, ac and coil, was $4,600. Replaced older furnace and ac unit with a Trane XV95 gas furnace and a Trane 4TRW 3-ton Heat Pump system. Condensate drain tube from coil was clogged. Cleaned tube and trap, replaced weak 10 amp blower capacitor, service call fee, environmental fee, and labor for 45 minutes. Unit is 19 years old and the company recommended replacement. Local company wanted $3500 to install furnace only. Bought ours on eBay for $550, paid an off-hours crew $550 to install it for me. Saved a lot of money using the DIY method. Had system replaced during storm, and saved 10% of the furnace installation cost by signing a 2 year maintenance agreement for annual service. Replaced our 12 year old Rheem furnace with a new Goodman 95% GMCV95 gas furnace. The 3 guys installing it had it done in a half-day in our basement. So thankful to have heat again. Replaced our 16 year old, broken central hvac system with a new Trane system. Price was very fair for a good quality setup. Took 3 workers about a half day to get it done. Replaced our old Carrier gas furnace with a new, higher efficiency system. We added a dehumidifier to the duct as well, and it took 3 guys about 6 hours to complete the job. Decided to make the move to high efficiency and chose a Carrier Infinity system. Yes, the price was slightly higher than others, but from friends and family who have them, it seems like it is a good choice. Infinity Gas Furnace, 2-Stage AC unit, Coil, Humidifier and Thermostat. Took 3 guys 1 full day. Coldest day of the year our heater broke. We called for repair and a new furnace heat exchanger (looked like cottage cheese) was going to cost more than $1500 installed, and we had to wait 4 days to get the parts in stock. For $900 more, they put in a new Goodman gas furnace the same day. We got 3 different Trane gas furnace price quotes, and each of the companies wanted to sell us a whole central hvacs system versus just the furnace installation. The guys we chose weren’t the cheapest, but we trusted them the most. 3 person crew, 5 hours. included some new duct that was bad, as well as a new programmable thermostat. Merry Christmas right? Our heating system failed on Christmas morning, and the gas furnace replacement cost alone was almost 3 grand. Since the whole thing was more than 10 years old, we had it all replaced. Details – Furnace would not start up last week so we got several quotes and finally settled on a Bryant forced air gas heat system. When should a gas furnace be replaced versus repaired? The furnace’s general parts warranty has expired and major repairs are needed. It is 15+ years old and has needed minor repairs that are adding up. The heat exchanger is cracked. Even if the part is under warranty, most warranties do not cover the labor cost. To replace a heat exchanger, the core of the furnace must be taken apart and re-assembled at a labor cost of $800 or more. The furnace is getting older, and you’d prefer one that is more efficient and/or has better comfort features than your existing furnace. Do I have to get a permit for removal and installation, and if so, why? In most municipalities, a permit is required to remove and replace a gas furnace. Homeowner safety is the main reason. Inspectors visually inspect and test the gas connection to make sure it isn’t leaking. This reduces the risk of fire and explosion. They inspect the exhaust to determine that it is not leaking. This reduces the risk of potentially deadly carbon monoxide leaks. Electrical connections are inspected to make sure there is no risk of electrical shock or fire. Can I buy a gas furnace online and install it myself? Yes you can. There are several online furnace sellers who are authorized by the manufacturers to sell HVAC equipment online. Your brand options are limited to Goodman, a few Rheem/Ruud furnaces and budget brands. 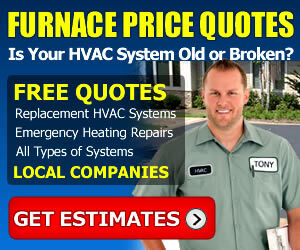 Buying a furnace online and installing it yourself voids most warranties. There are inherent risks when a furnace isn’t properly installed including potential gas explosion and carbon monoxide leaks. A furnace must be correctly installed and the blower tuned for the unit to run as efficiently and durably as possible. Can gas furnaces can be converted to propane? 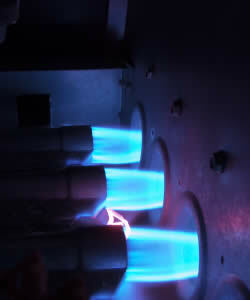 Most furnaces equipped to burn natural gas (NG) can be converted to propane (LP). Conversion kits are available for $35-$60 that include the handful of parts required including the right size gas valve orifice for LP. How do I choose the proper gas furnace size? Getting furnace size (capacity) right is critical to indoor comfort and efficient heating. Using a common rule of thumb such as 35-45 BTUs per square foot is very hit-or-miss. You’re as likely to end up with the wrong size furnace as the right capacity. Pros use load tests known as Manual J, D and S to determine proper furnace capacity. These load tests calculate how much heat your home needs at peak times. A long list of factors are considered including size and layout of your home, its windows and insulation, roof type and material, the landscape and the local climate. When replacing a furnace, it still makes sense to do load testing rather than simply buying a new furnace with the same capacity as the old one. Many contractors in the past installed furnaces that were too large, “just to be on the safe side.” Furnaces that are too big cause temperature swings and uneven heating throughout your home. They waste energy too. Also, if you have upgraded windows and doors and/or added insulation, it’s quite possible the replacement furnace should be smaller than the old one. What AFUE or furnace efficiency should I choose? The colder and longer your winters are, the more efficient your furnace should be. In warm climates, an 80% furnace is a cost-effective choice since the furnace gets little use. In moderate climates with periods of freezing weather, a 90% to 95% furnace is a better choice. The higher cost of the furnace will be recouped through lower heating bills in as little as 3 years. This is called the payback period. Where winters are extreme, a furnace with 95% or higher efficiency will help control heating costs. What accessories should I add to a gas furnace? There are several popular options. Even if the old thermostat works with the new furnace, you might want to upgrade to one with more features such a programmability, WiFi or compatibility with a smart home system. Large HVAC manufacturers offer a performance upgrade called communicating technology. Trane ComfortLink, Carrier Infinity and Goodman ComfortNet/ComfortBridge are examples. A communicating thermostat receives information from system components such as an AC and the furnace to sync their performance. The result is optimized heating and cooling efficiency and comfort. Communicating technology is available only on top furnaces from brands that offer it. A humidifier combats dry indoor air, especially in cold climates where the furnace runs frequently. Dehumidifier add-ons are available too. They’re used in cool, damp times of the year when AC isn’t required. There are several types of air cleaners with enhanced filtration. They are useful when someone in the home has breathing issues such as allergies or asthma. Thick media filters, HEPA filters, electronic air cleaners and UV lights are all available to remove or kill allergens and other pollutants in the air. What are the most important features when buying a gas furnaces? Furnace features make the climate in your home more comfortable. Staged heating: Upgrading to a two-stage furnace boosts cost by 15% to 25%. The furnace will run at low capacity as much as possible. This produces longer, gentler heating cycles. The result is temperatures that are more precise and balanced throughout your home than a single-stage furnace can achieve. Choosing a variable capacity furnace can be a 50% cost jump. These furnaces modulate the amount of heat they produce by as little as 1% and take indoor comfort and temperature balance to the next level. Variable-speed blower: Many two-stage and all variable capacity furnaces have variable-speed blower fans. The fan speed is coordinated with the stages of heating (or cooling, when supporting air conditioning). The result is the reduction or elimination of cool air being circulated at the beginning or end of a heating cycle. When the AC is running, staged cooling and a variable-speed fan remove more humidity from the air. Installation: You could purchase the best furnace on the market, with all the features that promise to provide you years of comfort, making you the envy of your friends and neighbors. Unfortunately, if any furnace is not installed correctly, you’ll never achieve those results. If you take one thing away from this guide, understand that the importance of proper installation is key for both performance and your safety. What is Communicating Technology and Is It Worth It? In standard HVAC systems, the thermostat sends commands to the furnace and AC. It’s a one-way street. Communicating systems use thermostats that also receive performance data from the furnace and air conditioner, a two-way street. The purpose of the communication is to finely tune heating and cooling performance to optimize climate control and energy efficiency. Several major brands make proprietary communicating systems. Trane ComfortLink, Goodman ComfortBridge and Heil Observer are a few examples. Some HVAC contractors try to upsell their customers using the indoor comfort benefits of communicating technology. The benefits are balanced and perhaps outweighed by the potential negatives. First, the cost for the enhanced thermostat and the addition of communicating components ranges from $900-$1,200. Plus, the option is only available on the most expensive two-stage and variable capacity systems. Finally, these systems sometimes stop communicating. When that happens, the system won’t run at all, and the problems are notoriously difficult to locate and solve. The person selling communicating equipment might be a fan, but the one trying to repair it probably isn’t.